Mungo Jerry’s, Long Legged Woman Dressed In Black, charted at number thirteen in the Spring of 1974. Written by lead singer and songwriter Ray Dorset, it was Mungo Jerry’s eighth hit single and followed on from their previous hits, Alright Alright Alright (#3) and Wild Love (#32), both from 1973. The song was often adopted by football supporters all over the UK – something about the inadequacies of the referee I seem to recall! Tracks: Long Legged Woman Dressed In Black/Gonna Bop ’til I Drop. “I was working with the band on a number of various recordings for the possibility of single and album release and Barry had a snippet of an idea that he put to me. “I came up with the arrangement and rehearsed it with Ian at his house and we finally recorded it with the band but with a different lyric. “The one that I had was based on a novelty idea and a little risqué and I changed it to Long Legged Woman, which Barry thought was better”. “The Waterboys played Long Legged Woman Dressed In Black many times during our 1986 tour, often as a crowd-rousing encore”. Written by Ray Dorset, and with the good-humoured sort of pop for which the group is well known…it swings, and there is a reasonably catchy hook to it, and it’s repetitive, and it’s very bright. The thing is that you feel yourself foot-pounding along with it, without necessarily knowing why it’s all undemanding or happening! But the Jerry-builders create good and undemanding pop records. Fair enough? There seems to be a lot of these long legged women about these days – where are they all coming from, eh? This, as you might imagine is a teen-oriented choogler complete with a voice and drum sequence in the most voguish of contemporary manners. 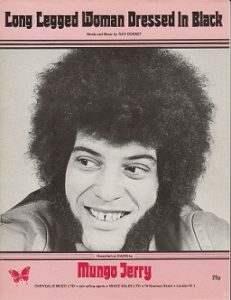 Perhaps Ray Dorset’s voice isn’t quite extreme enough to propel Mungo Jerry up among the Mud’s and the Sweet’s but one anticipates seeing this single somewhere in the charts one of these days. The predominant theme seems to be “every time I make a move she tells me no” and there are some fierce guitar breaks and a lot riotous drummery. By no means unpleasant. Long Legged Woman Dressed In Black was backed on the b-side by Gonna Bop ’til I Drop but it was re-recorded in more recent times by the rockabilly version below. Both are excellent but ‘maybe’ this one just shades it. 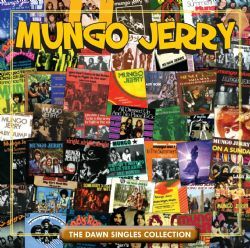 You can pick up Long Legged Woman Dressed In Black on a 2CD set available through CHERRY RED RECORDS, which is a collection of all of the A and B-sides of all of Mungo Jerry’s singles for the highly collectable Dawn record label.